Students from TanenbaumCHAT in York Region have just returned from a unique twelve-day Israel program, studying and conducting research at the Eilat campus of Ben Gurion University. The research expedition, which saw 30 Grade 10 students make the trip to Israel’s south, was developed in conjunction with UJA Federation of Greater Toronto, which is partnered with Eilat-Eilot, through the Jewish Agency’s partnership2gether initiative. 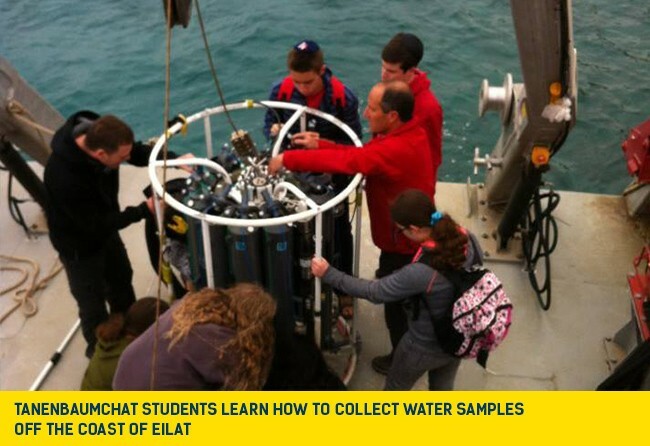 The program – the first of its kind – was focused on marine biology, taking advantage of Eilat’s distinctive climate, location and ecology. Working in teams, pupils learned how to conduct field research in a range of areas including oceanography, water ecology and animal behavior. They worked in laboratories, on the water and even underwater, studying coral reefs, fish, dolphins and much more. The group visited the Eilat aquarium and underwater observatory as well as Kibbutz Lotam, an ecological community which is conducting pioneering research into water conservation and waste disposal. The group also spent time in Jerusalem and Tel Aviv and visited the town of Sderot, which is located on the Gaza border and has been pounded by rocket fire for more than a decade. Indeed, one of the highlights of the program was meeting Israeli pupils from Eilat who are currently taking part in the Diller Teen Fellows program. The Canadians and Israelis came together for a desert hike, a barbecue, and an interactive program on the diversity of Israeli society. Zane Stekel, another group member, also enjoyed getting to know the Diller fellows. The meetings were equally valuable for the Israeli participants. The students were accompanied by TanenbaumCHAT science teachers Ms. Carr and Mr. Kitchen, as well as Rabbi Buckman, head of school.